Abacus wins awards at Sarasota and Ashland! 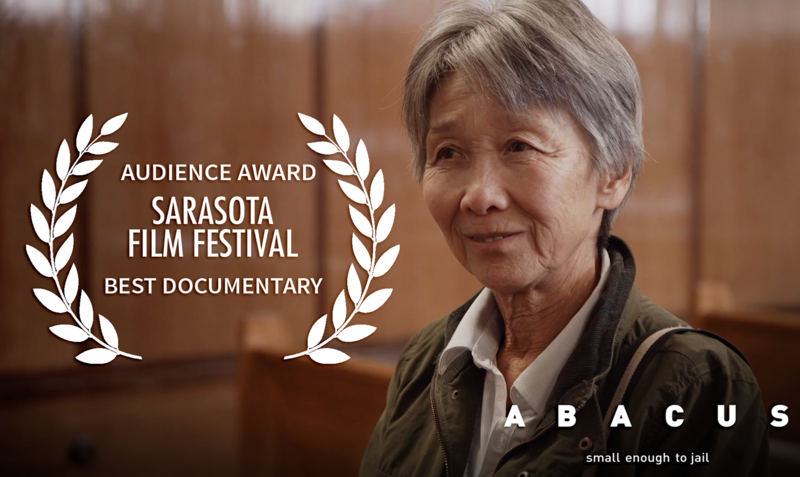 Abacus: Small Enough to Jail, the latest film by director Steve James, enjoyed a triumphant weekend which included taking home the Audience Award for Best Documentary at the Sarasota Film Festival, and Best Editing: Feature Length Documentary at the Ashland Independent Film Festival. The weekend's highlights also included serving as the sold-out opening night film at the 20th Annual Full Frame Documentary Film Festival, and screenings at the Hawaii International Film Festival and the Dallas International Film Festival as part of the film's 18-festival run during the month of April. I can't stop thinking about Abacus: Small Enough to Jail. Such a profound film. Both the Sung family and the film were hits at the Sarasota Film Festival, earning the Audience Award for Best Documentary––ultimately culminating in a third screening being added on April 9th due to popular demand, after two sold-out screenings on April 1 and April 3. Abacus closed out its busy weekend by earning Best Editing: Feature Length Documentary at the Ashland Independent Film Festival. Next up, the film heads to the Hong Kong International Film Festival for its Asia Premiere, screening on April 14 and 22 as well as the It's All True International Documentary Film Festival in Brazil for its South American Premiere. The film begins a US theatrical theatrical run at the IFC Center in New York on May 19. To stay up to date on all things Abacus and find out when it's screening near you, you can follow the film on Facebook, Twitter and Instagram. Our congratulations goes out to a KTQ Labs graduate documentary: Quest, which was the winner of Grand Jury Prizes at Full Frame, Dallas, Ashland and RiverRun this weekend.